Meals: Past & Future | Season It Already! Posted on November 17, 2014 by Carrie @ Season It Already! I pinned this recipe for a Slow Cooker Apple Cider Pulled Pork over a year ago. I finally made it last weekend. What made me finally take action? I had few extra Honeycrisp apples in need of some transformation. The Sunday night Packer game on TV last weekend meant we could eat in. Rob was game. Plus, my crockpot broke and I needed a reason to use my new one. This one has a timer and I found it for a steal at only $29.99 at Costco! I also broke out my box of Red Lobster Cheddar Bay Biscuit Mix that I bought specifically for Rob. He’d heard about these biscuits, but had never been to Red Lobster because he’s allergic to seafood. For the record, they weren’t all that great. Not nearly as good as I remember them from 15 years ago. They were too biscuit-y and did not as much flavor as I remember. There’s a copycat recipe to make your own here. See those sauces? The recipe suggested serving this with barbecue sauce. You may or may not know how I feel about barbecue sauce. Or the fact that I found one I liked while in Charlotte. I think it was mustard-based, so I picked one up at Trader Joe’s and put it right along our Pig Polish from Charlotte for a little taste test. I actually liked them both; while Rob preferred the Carolina Gold. What can I say? I didn’t mind them at all. After a couple of days of leftovers though, I was done. Rob commented that the pork really didn’t have any flavor before putting the barbecue sauce on it. I probably wouldn’t make this again. I’d rather drink my hard cider than use up four bottles in my slow cooker. I can make pulled pork other ways. Because I don’t usually like my burgers reheated, I kind of repurposed the leftovers throughout the week. For breakfast, I sliced a turkey burger in half and added it to my 90-second Breakfast Sandwich, slathering on a bit of leftover Jalapeno Cilantro Hummus from Ansari’s. I may just add the spinach and feta and Dan’s seasoning blend to ground turkey or beef without making patties and using it to top some Power Bowls soon! Let’s move on to this week! Monday – Since Rob and I are still on the eat-on-our-own kick, I’m finally going to try Biz’s award-winning Buffalo Chicken Chili! I’ll have leftovers all week for lunch! Tuesday – Last week, I didn’t make the Roasted Butternut Squash, Onions and Red Potatoes that I had planned because I had so much leftover blue cheese coleslaw. Luckily, those are all vegetables that keep well so that I can make the dish this week to accompany my last two Chicken Thighs I need to cook up. Thursday – Breakfast for dinner – Eggs with Asparagus and Pesto, perhaps? I have eggs on hand, some asparagus I chopped up and froze to keep it from going bad and a jar of pesto in the fridge. Friday – Poker Night. I wonder who will win the Koala this month? Saturday – Rob’s Birthday – I think he’s finally chosen Borough, but that could still change! 90 second breakfast sandwiches or egg scramble with cheddar and miscellaneous veg. 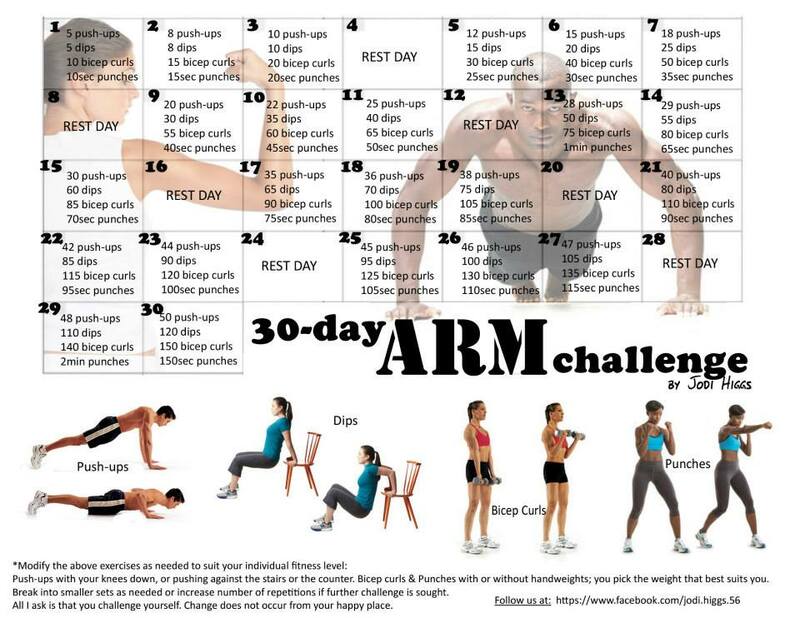 Basically what I’ve been doing is 5 days of run-walk intervals (more walking than running to apease my back) and this 30-day Arm Challenge. I’ve unintentionally added some additional rest days. But at least I’m doing it! What does your menu look like this week?